By: Feak, Christine B., Swales, John M.
23 cm xiv, 418 p. : ill. Explains understanding the intended audience, the purpose of the paper, and academic genres; includes the use of task-based methodology, analytic group discussion, and genre consciousness-raising; shows how to write summaries and critiques; features "language focus" sections that address linguistic elements as they affect the wider rhetorical objectives; and helps students position themselves as junior scholars in their academic communities. Among the many changes in the third edition:newer, longer, and more authentic texts and examplesgreater discipline variety in texts (added texts from hard sciences and engineering)more in-depth treatment of research articlesgreater emphasis on vocabulary issuesrevised flow-of-ideas sectionadditional tasks that require students to do their own researchmore corpus-informed contentThe Commentary has also been revised and expanded. 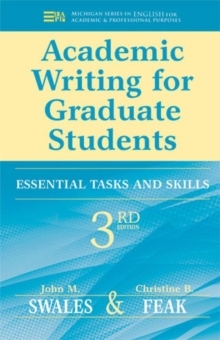 This edition of Academic Writing for Graduate Students, like its predecessors, has many special features:It is based on the large body of research literature dealing with the features of academic (or research) English and extensive classroom experience. It is as much concerned with developing academic writers as it is improving academic texts. It provides assistance with writing part-genres (problem-solutions and Methods and Discussion sections) and genres (book reviews,research papers). Its approach is analytical and rhetorical-users apply analytical skills to the discourses of their chosen disciplines to explore how effective academic writing is achieved. It includes a rich variety of tasks and activities, ranging from small-scale language points to issues of how students can best position themselves as junior researchers.